Because I am quite certain that you are not sick of pumpkin just yet (how could you be?) 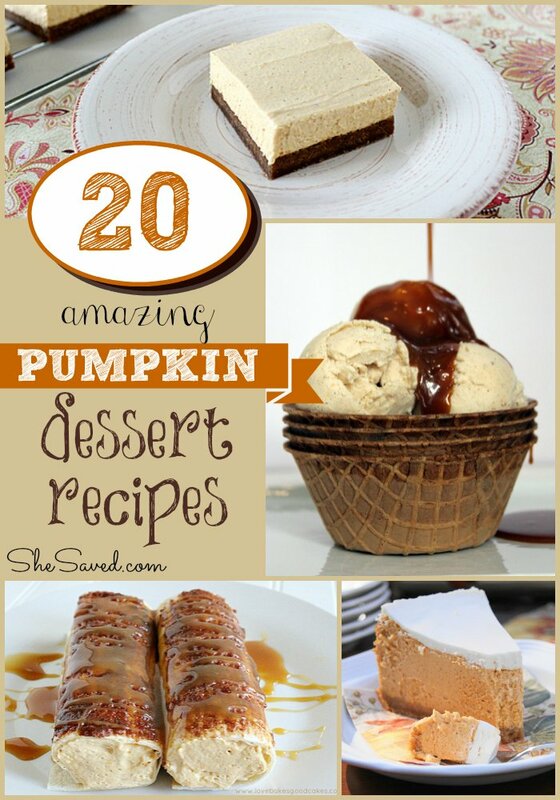 here is yet one more delicious round up of Pumpkin joy for you! And, because you will want to eat your dinner before your desserts, make sure to check out last weeks round up of Pumpkin Dinner recipes. Be sure to check out all of the other wonderful pumpkin love that I have shared, including Pumpkin Cake recipes and my round up of Pumpkin Cookies as well! And then, because you can never have too much pumpkin, you will want to check out my round up of Pumpkin Latte recipes as well as my 13 Delicious Pumpkin Muffin Recipes. Looking for Fall breakfast ideas? Then make sure to check out my Pumpkin Breakfast Recipes post! Whew! How’s that for some pumpkin love!! ?